Looking at adding a platform to our 2000 FV270 for next season. I like the top mount designs for a clean entry and am currently looking at two companies in Canada and swimplatforms.com in the US, but with the dollar right now, pricing would be a factor. I am also a little limited by the available slips at our marina and don't wish to move, so I might be stuck at around 36" from transom overall. Otherwise the bow sticks too far into the channel. Interested in opinions/experiences of others, particularly 270 owners that have gone down the road before. Things to watch for? Any changes to performance, handling, getting on plane etc? For my 232, I brought the boat directly to the guys at swimplatforms.com and had them build a custom 45" deep, on top style for my boat. It absolutely is the best upgrade I've ever done to any of my boats! Swimplatforms.com did mine, best money spent. I think mine is a bit larger and higher than the factory unit. Zero affects on performance, zero drag, and very sturdy. A big difference in usable space and a lot safer than the catwalk. LMK if you want pics. 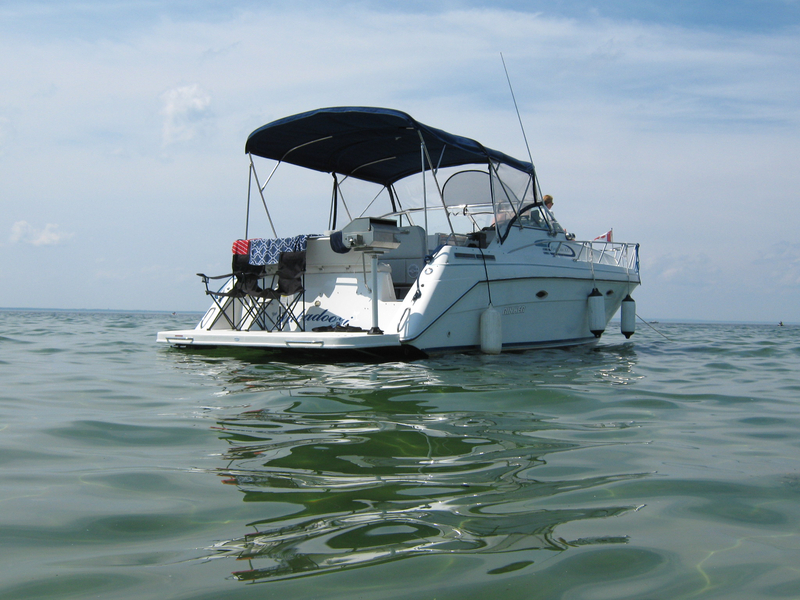 @rinker270nb - what year is your FV270? Any pictures of the swim platform? Yep. Pics if you got em. How deep did you go? 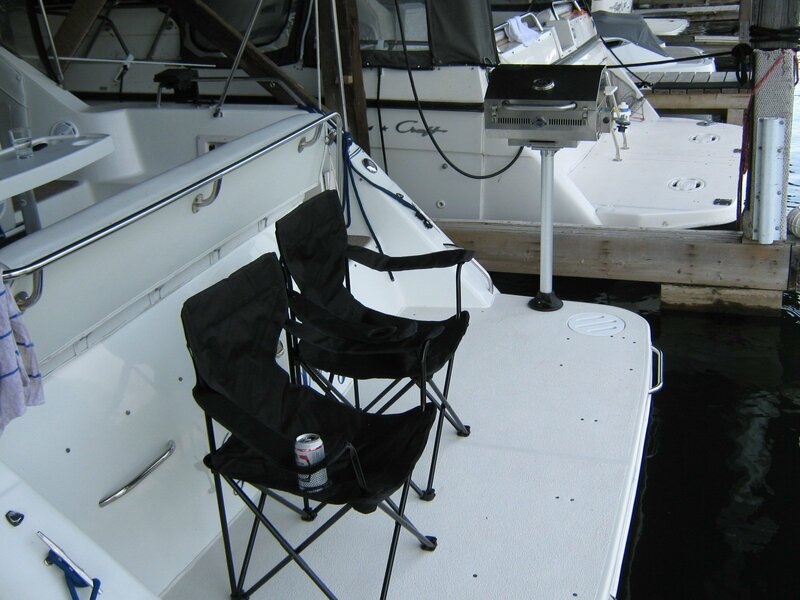 This is pic of 03 , it is factory 32 inch which is great, Not sure what the back of 2000 looks like, If you have a choice, try and get it up high as you can, easier to step up and down from the dock, as well as this location is only 1/2 inch about the water. A Doral owner at our marina had them build a HUGE platform (about 10 feet wide and 5 feet deep) that looks really well constructed. Both outfits were at the Toronto Boat Show last year, hoping they'll be there this year so I can talk with them. Just not sure about timelines if I wait until then. @F1100 ; what kind of lead/delivery time are you expecting? Mines a 1999 270. Here's an on-forum pic, it sets on top of the original catwalk and sits pretty high, in a good way! Thanks @rinker270nb, good pic, essentially what I'm looking for. I will give swimplatforms.com full marks for getting back to me with a very detailed and very quick quote. I e-mailed late last night and got an answer by noon today, our time, so considering they are in Phoenix, they got on it first thing. Was quoted $1695 for the platform, $98 for crating, $376 for shipping and $63 if shipping to a non-commercial address. So total is $2232 US. With today's exchange it'd be $2785CDN. One of the two Canadian companies replied, but said that they didn't have a template for my year/model. They have offered to give me an approximate quote based on a pic of my boat, the width and length of existing platform and the size of the new platform I'd like. And if it looks good, they have an installer that's going to be in the area in about two weeks on another job that could come and do the template after which I get a hard price. Might investigate this further. Let me know ow if you want add'l pics. I broke the strap for the ladder and swimplatforms.com sent me another, no problem. Their service has been great! the total cost was under 3000, so cheaper than the USA company as well. And I would think the platform for your 300 would be a bit bigger. If I don't hear back from them by the end of the week I'll give them a shout. Just saw that a 2002 270FV swim platform was just listed on EBay for anyone looking for one. Current bid is $150. Reviving this thread because after putting it off the last two seasons we're finally moving ahead with the new swim platform. Had other issues that were "musts" before we could do this. Will be templated Wednesday and builder assures me they can turn it around in time for me to install and meet our May 1st launch date. Will post pics as it goes. Also, @raybo3 I tried going back to the link shown by @rinker270nb above and get an error message that it can't be found. Anything to do with the upgrades? No worries @raybo3 . Enjoy your vacation and don't worry about the board, I'm sure it'll still be here when you return. I don't really need to see that link, was just curious. Thanks @rinker270nb. I do like the look of those platforms. Our local company doesn't do the bevel on the sides or sweep the outside corners in, so a little clunkier looking. But looks solid anyway. 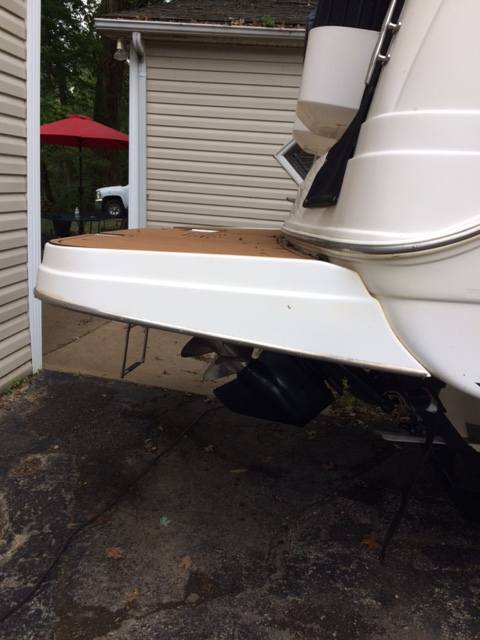 While sweeping the corners may look nice, it would be my number one reason for not buying a boat. It makes it extremely difficult for boarding the boat. It also is terrible when you raft-up, very difficult to step on to. 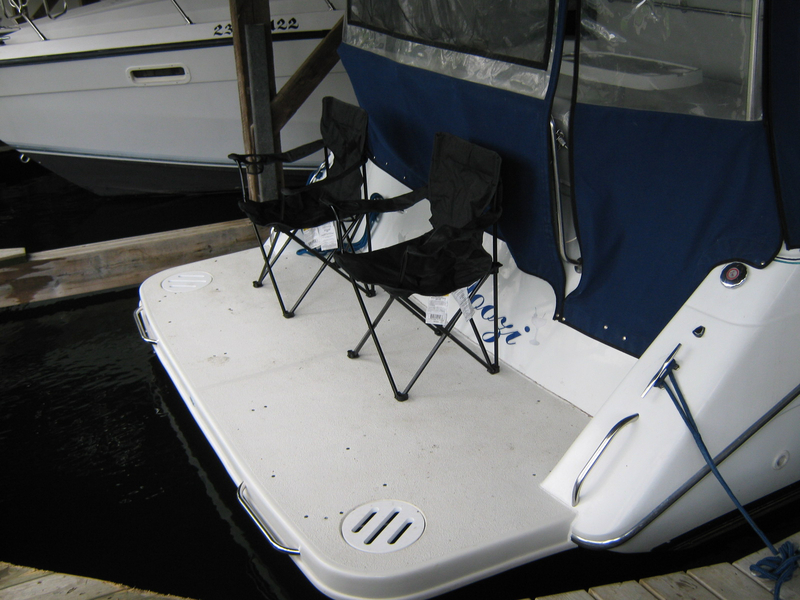 I have a friend that has the 350 with the rounded platform and it is nearly impossible to get onto from the dock at the platform. Sorry, I guess you hit a sore spot It is a nice looking platform. Well Guys, got the replaying done the other day. Platform is promised for plenty of time to install before May 1st launch. Went with the local company. Will post pics. If your at floating docks which is common, it's just the opposite..it's flush to the dock generally. @F1100 it was your install and the PM's we traded that convinced me to stick with these guys. A very solid looking platform. I was getting frustrated because the communication back and forth was a little slow and we had difficulty finding time to meet up because they had offered to come over and do the template as part of the deal. Was really happy I held on though, Matt was a great guy and we had a good discussion about how the platform would be built. I opted for a top mount ladder and also discussed using the Easy Up Swim Handles ( http://www.easyupswimhandles.com/ ) which they had seen before and are taking into account in the build. I wanted the ladder and handles to line up with my entry, so as a result instead of the two vents in either corner we're going with a larger SeaRay style vent in the middle so it doesn't impede on the handle locations. Will also allow me to inspect the single drive I have from above. Should be ready in another week or so, just in time to get it on for launch. Also curious, did the marina nail you with the extra L.O.A.? 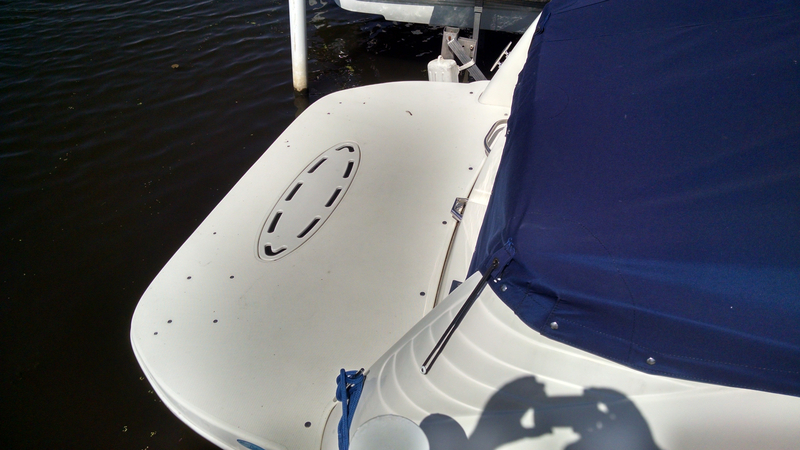 Our marina has always gone by manufacturer designation, so my 270 is charged at 27'. not the almost 30' it really is. But we have new owners this year, so it remains to be seen if they're going to stick to that formula or start measuring. If they do, the platform will likely cost me an extra $350 a year in slip fees. I bet they won't notice unless you bring it up....boats that have the built in platform would be included in the over all length right? This is a plus hopefully adding 3' for free! Looks great and I'm sure yours on the 270 will also....I think mine is a big plus for hanging out and getting on and off the boat.....it's amazing what 3' adds to the overall length of a 270....heck that is adding 11%!